Tim Hayes first recognized horses' power to heal when he saw a burly gang member from South Central Los Angeles come face-to-face with a wild mustang — and his own true nature. It was 1996, and Hayes, then a TV commercial producer in New York City and amateur horseman, had traveled to a federal super-max prison in Florence, Colo., known as the "Alcatraz of the Rockies." He went to observe the Wild Horse Inmate Program, established in 1986 by the Bureau of Land Management and the Colorado Department of Corrections to "gentle," or tame, free-roaming horses from the American plains before they're put up for adoption. The recidivism rate of WHIP inmates is half the national average. Hayes watched Morris, the former LA Crip who'd never been around a real horse before, confront a thousand-pound snorting, kicking and thrashing beast. In that moment, Hayes remembers, Morris seemed to see himself in the mustang's wild eyes: not a violent, rage-filled killer who'd once crushed a man's skull with a car door, but a terrified creature who had to fight just to stay alive. "They act tough, but I think they just scared. Yeah, they ain't mean," Hayes recalls Morris telling him afterward about the horse — and himself. "Maybe once you get to trust 'em, they trust you." Hayes spent a week with WHIP inmates. In that short time, he witnessed an incredible transformation in Morris and other men whom society had written off as beyond redemption. "The inmates were trying to gentle the horses, but in truth the horses were gentling the inmates," Hayes writes in his new book, Riding Home: The Power of Horses to Heal, published in March by St. Martin's Press. Years later, Hayes discovered that horses have an uncanny ability to gentle people grappling with other physical, emotional and behavioral difficulties: troubled teens, drug addicts, kids with autism and combat veterans suffering from post-traumatic stress disorder. 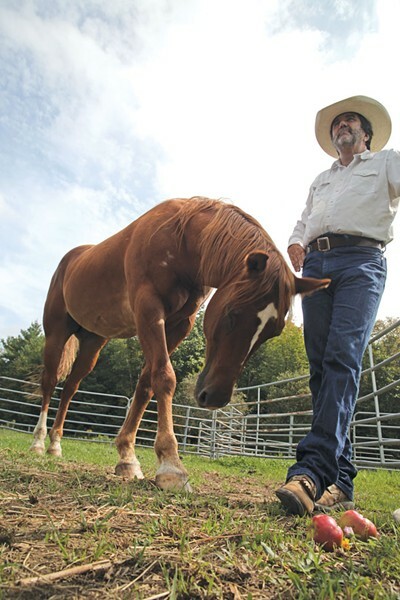 Today, at a farm in Vermont and elsewhere, Hayes helps horse enthusiasts tap that healing power. It's a force that helped him recover from his own traumas, including the death of his mother, his upbringing by an alcoholic, abusive father and the horrors of 9/11, which he witnessed up close. Hayes teaches a method of equine training known as natural horsemanship, sometimes called "horse whispering." Robert Redford, who directed and starred in the 1998 film The Horse Whisperer, wrote the forward to Hayes' book. Unlike traditional forms of horsemanship that involve "breaking" a horse and getting it to submit to a rider's will through fear, pain and brute force, natural horsemanship teaches people to understand and respect horses' nature. Riders learn how horses read and use body language and establish their place in the herd. As riders become more attuned to that physical language of horses, they see how it mirrors their own and what it's "saying" to their horse, and to themselves. And, Hayes points out, it's always an honest reflection. As he puts it in his book, "Horses help us discover hidden parts of ourselves ... A horse has no ego, he never lies and he's never wrong." I first meet Hayes on a humid, overcast morning at the Center for America's First Horse in Johnson, not far from his house. The 70-acre horse farm overlooking the Green Mountains is about a mile from Johnson State College. Hayes' fiancée, Stephanie Lockhart, who also teaches natural horsemanship, founded the center in 2010 and is still its director. The nonprofit is home to the largest and most diverse herd of Spanish mustangs in the eastern United States, including one celebrity: Oscar, a 24-year-old gelding who starred in the 2004 Disney biopic Hidalgo, about American distance rider Frank Hopkins and his Spanish mustang. Though a bevy of impressive creatures grazes lazily in the pasture, Hayes doesn't usually ride a mustang. His preferred steed, whom he calls his "greatest teacher in life," is a 26-year-old registered quarter horse named Austin. "Like me, he doesn't look his age," Hayes jokes. Indeed. Despite his dapple-gray beard, the 70-year-old could easily pass for someone a decade younger. Dressed in well-scuffed boots, Wranglers, a button-down shirt with pearl snaps and a straw cowboy hat, Hayes cuts the figure of someone who grew up roping calves and hauling hay bales — not riding subway trains and hailing taxis on Broadway. Personally, I've never considered myself a horseman, even after five years of living on a horse ranch near Missoula, Mont., and another four working as a ranger in a Texas park where, on rare occasions, I patrolled on horseback. Before meeting Hayes, I had a healthy respect for horses but little understanding of their psychology. Still, knowing I'd meet the writer's equine partner, I picked a few apples from a neighbor's tree before leaving home. When Hayes leads Austin out of his paddock, I offer him one. "This is Ken. He's got an apple for you," Hayes says, introducing the chestnut gelding. Austin gives it a perfunctory sniff, then turns his nose away. Having read Hayes' book, I wondered what unwitting message my "greeting" conveyed. Hayes leads Austin to a round pen, then explains the "groundwork" he teaches students before they ever mount a horse. Austin stands patiently in the humid, windless air as flies pester his face and body, making his spine twitch and legs shuffle. Even the insects provide a lesson in natural horsemanship. "Here's a fly getting a thousand-pound horse to lift his leg," Hayes points out. "That tells us that if I want him to move, maybe I don't need to use any more pressure than a fly." Horses, he explains, have three primary motivations: First, as prey animals, they need to feel safe from predators and are always hypervigilant to their surroundings. Second, they need to feel comfortable and will seek out places and fellow creatures, including humans, that offer company, food and protection. Finally, as herd animals, they need to know who's in charge. "Just like a couple that's dancing, someone has to lead. And for our safety, we have to be the leader," Hayes says. "But we don't want to force our leadership. We want to earn our leadership. We want our horse to say, 'I'm happy for you to be the leader because you make me feel safe.'" To demonstrate, Hayes walks to the center of the ring and momentarily makes Austin feel unsafe and uncomfortable. He unfurls a rope and swings it in Austin's direction without hitting him. The horse begins trotting around him in a wide circle. When Hayes wants Austin to move faster, he swings the rope closer to him, still not making contact. Austin increases his pace to a canter. "Horses have a personal space, just like you and I do," Hayes says. "So I'm getting into his." When Hayes wants Austin to stop, he kneels and stares at the animal's hindquarters. Austin halts instantly and slowly sidles up to his owner. What just happened? Hayes explains using an urban analogy: You're walking alone in New York City at 4 a.m. when you hear shouting, breaking glass and crying. Do you get moving? Obviously. The next night, you hear the same commotion, only this time Arnold Schwarzenegger is by your side, ready to defend you. "Do you run away, or do you stay with Arnold?" Hayes asks. "You stay with Arnold. What I do is teach people to be an Arnold Schwarzenegger to their horse." Next, Hayes invites me into the ring, hands me the rope and walks outside the fence. "OK, now you're the leader. What's it going to take to get Austin to go around?" "Austin, go around," I shout. "He doesn't speak English," Hayes says. I feel stupid. I swing the rope into Austin's space. He starts trotting circles around me. "Good, keep him going," Hayes yells. "Now, squat down and look at his hip." I obey, whereupon Austin stops, then walks up beside me. "Now walk toward me and keep walking, then make a right turn," Hayes says. This huge animal, which 20 minutes earlier had spurned my apple, is now matching my every step. "Did you see him following you?" Hayes says. "You're Arnold Schwarzenegger!" Hayes discovered his true calling in life only after riding a long and improbable path. Born and raised in New York City's Greenwich Village, he didn't sit on a horse until he was 47 years old. Hayes' father was one of the real-life "Mad Men" who produced TV commercials on Madison Avenue in the 1950s and '60s. Like the fictional Don Draper, the elder Hayes was also an alcoholic; he had a temper, and left the family when Hayes was 17. In his book, Hayes describes his parents as "emotionally unavailable and physically unaffectionate." Beginning when Hayes was 12, they fought frequently and violently. To protect himself physically and emotionally, Hayes says, he became "like a horse": hypervigilant and constantly searching for "even the tiniest behavioral sign" of imminent danger in his parents' facial expressions and body language. As he writes, "My desire to control horses through communication, as opposed to force, was in some way linked to the wounded relationship I had with my father and my rejection of his use of force, fear and intimidation to control me and others." Years later, Hayes would train with some of the world's foremost experts on natural horsemanship. Many, he discovered, had also suffered from "wounded relationships" with their fathers. Hayes suspects that they rejected the use of force on horses for the same reasons he did. Hayes attended the University of Vermont, initially with the goal of becoming a psychiatrist. After nearly flunking organic chemistry, he abandoned his plan to attend medical school and pursued psychology — but he lacked the grades for grad school. So, after graduating in 1967, Hayes got a job like his dad's: making films and TV commercials. He spent the next three decades as a writer, director and producer. If you're old enough to remember such iconic '70s ad slogans as Alka-Seltzer's "Try it, you'll like it" and "I can't believe I ate the whole thing!" you've seen his work. By the 1990s, Hayes had already married and divorced; he ran his own production company and had plenty of free time. In 1992, he drove out west on vacation and ended up on a ranch in southern Idaho. Hayes arrived the day the horses were being shoed. The farrier, a man named Black, was a cowboy whose 16-year-old daughter was an Idaho state roping champion. She had her champion roping horse with them in the trailer. Hayes asked for a ride. "I'd never been on a horse. I knew nothing," he admits. "Then something happened. I was like, Wow! This horse is so attuned to everything I'm thinking and doing! If I thought I was going too fast, he'd slow down. If I thought we should go that way, he'd go that way." The Black family owned a 150,000-acre cattle ranch in Bruneau, Idaho. Having never met anyone from New York City before, they invited Hayes to visit the following year and stay for as long as he liked. Over the next four years, Hayes returned every chance he got, learning to ride, rope, brand and cut cattle. He quickly realized he wanted horses in his daily life. "It wasn't a plan; it wasn't a dream. Like some people fall in love with golf, I fell in love with horses," he says. "This is what I did when I wasn't making commercials." At the time, Hayes owned a second home in East Hampton, Long Island. Beginning in 1993, he volunteered as an instructor and trail guide at Deep Hollow Ranch in Montauk, the oldest cattle ranch in the United States. It's where Teddy Roosevelt and his Rough Riders encamped after the Spanish-American War. That same year, Hayes learned about Tom Dorrance. Then 83, the retired rancher and founder of the modern natural horsemanship movement had written a book on gentling horses called True Unity: Willing Communication Between Horse and Human. Hayes called the author at his California home and asked if he could learn his methods. Dorrance's wife, who answered the phone, invited Hayes to attend an upcoming clinic with his horse. "I said, 'First of all, I live in New York City. And second of all, I don't own a horse,'" Hayes remembers. "Everyone started to laugh in their house. I could hear it!" Hayes went anyway, and Dorrance found him a horse. Later, Hayes sought out other masters of natural horsemanship. Meanwhile, people in New York were hearing about Hayes' methods, and they began seeking his help with their horses. In 1997, Hayes learned that a state-of-the-art equestrian center was opening at the Hudson River's Chelsea Piers. The Chelsea Equestrian Center attracted what Hayes calls "hunter and jumper people" who rode English saddle and did dressage. Wealthy Wall Street types spent thousands of dollars annually just to be members. It was a far cry from Idaho cattle ranching. The center invited Hayes to give a demonstration on natural horsemanship, which so impressed the attendees that he was offered a teaching job. Three nights a week, Hayes would leave his Madison Avenue office, hop a cab downtown, duck into a tack room and — "like Superman changing my costume," he says — swap out his suit and tie for cowboy boots and Wranglers. Hayes taught at the Chelsea Equestrian Center from 1997 until it closed in August 2001. It was there that he met Austin, one of the center's many horses, all named for the world's cities: Paris, Boston, Boulder, London, Burlington. When the center folded and the other horses were sold off, Hayes purchased Austin and brought him to Long Island. The two have been together ever since. Austin's personality seems to mirror Hayes' own: calm, friendly, smart and eager to please. Years after he first encountered his horse, Hayes observed that riders often choose horses that match them temperamentally and feel intuitively familiar. 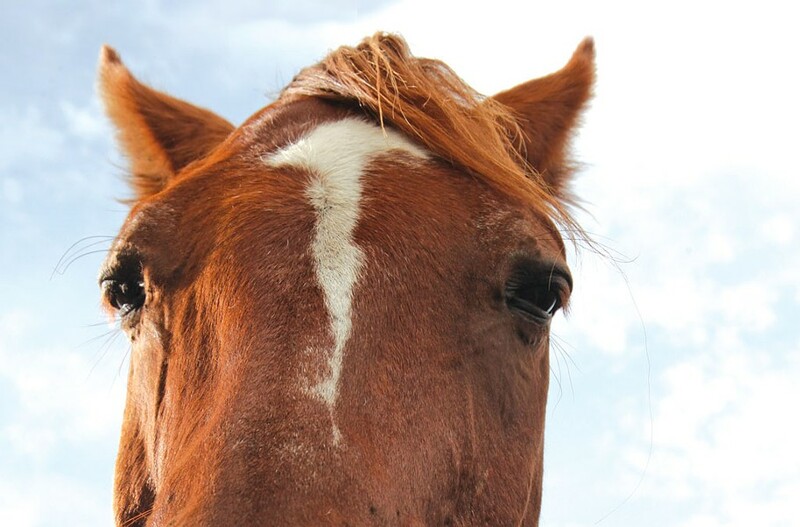 One reason why people with PTSD often relate better to horses than to other people, he suggests, is that both know what it's like to live with hypervigilance to one's surroundings. In fact, Austin would help Hayes cope with traumatic stresses of his own. Three events over 18 months convinced Hayes it was time to devote himself full time to horses. The first occurred after one of his brothers married a Brazilian. One night, while Hayes was visiting them in Rio, men invaded their house, tied everyone up and robbed them at gunpoint. For two hours, Hayes thought his life was over. Not long afterward, on September 11, 2001, Hayes was in his Tribeca apartment four blocks from the World Trade Center when he heard what he thought was a truck backfiring. Outside, at a school across the street, parents dropping off their kids were all staring at the sky. Hayes looked up to see the second plane hit the South Tower. "I must have seen 30 people jump to their death," he says quietly. When the first of the two towers collapsed, the dust cloud enveloped his building like a shroud. It was evacuated for three months. The following year, Hayes' mother died. Soon after her death, he remembers, he sat at his Manhattan desk thinking, If not now, when? So he closed his production company and moved to Long Island full time. In 2012, Hayes returned to Vermont to be with his now-fiancée. The couple had met three and a half years ago while both were giving horsemanship clinics at UVM. Hayes is still a visiting instructor there and at the University of Connecticut. Hayes says he decided to write a book about horses' healing ways as he observed people experiencing powerful "epiphanies" after being with horses even briefly. He watched an autistic girl become less combative and more communicative. An Iraq combat veteran told him, after spending a mere hour with a horse, "This is the first time since I came back from the war that I felt like myself." "Why [should our country] spend $40 billion on drugs and talk therapy," Hayes asks, "when all a guy has to do is spend an hour at a little place like this with a horse?" What is it about horses that people find so therapeutic? It's a combination of factors, Hayes suggests. "When you're with a horse ... you want to be safe, you want to have fun and you want your horse to feel the same way," he says. "So you're both mentally connected with each other. The moment you go back in your head to think about something else, you leave your horse — and he knows it." Johanna Silverman can relate. Several years ago, the 54-year-old nurse from Waterville was diagnosed with PTSD. When she was 7, her family was in a car accident that killed her father. The ride in the ambulance with him seared itself into her memory. "I remember him lying on the gurney in front of us, choking on his blood," Silverman says. "And I remember my mom saying to me, 'Oh, he's snoring. He's asleep.' For years I cringed whenever sirens went off." Less than six months later, Silverman says, her mother married a man whom she describes as physically and emotionally abusive. As an adult, Silverman treated her symptoms with therapy and prescription meds, but they offered limited relief. Then, a few years ago, she bought a horse. "If I'm having a bad day, just brushing him or leaning up against him and feeling his breathing grounds me and brings me back to where I need to be," she says happily. "It's therapy for me, because I dissociate all the time." Several months ago, Silverman took Hayes' class on natural horsemanship. Though Hayes does not focus specifically on equine therapy in the class, she emphasizes, he helped her by teaching her to be less "noisy" in her body language. Silverman also learned not to be afraid of being firm with her horse and how to distinguish that firmness from aggression. "The clinic felt like I'd just been through intense therapy," she says. "It was really cool." Dr. Mary Willmuth is a clinical psychologist at UVM and president of the board of the Champlain Adaptive Mounted Program at South Hero's Good Hope Farm. Vermont's oldest therapeutic riding program, CHAMP works with riders who have various physical, emotional, cognitive and behavioral issues: kids with autism, ADHD and Down syndrome; stroke victims and people with multiple sclerosis, spinal cord injuries and PTSD. Willmuth, herself an avid rider and internationally certified therapeutic horseback riding instructor, says Silverman's experiences are consistent with what she sees all the time. Besides receiving the many physical benefits of riding — such as enhanced balance, coordination and body control — riders who arrive at the barn agitated, anxious or distressed often calm down when they're on a horse. Less verbal clients tend to speak more, focus and engage better with the program's staff, she adds. Although Willmuth herself doesn't practice natural horsemanship exclusively, she has invited Hayes to the farm to give clinics, and says she sees tremendous benefits in his approach. "I have the utmost respect for Tim. He is wonderful with horses and wonderful with people, and I love to watch him work," she says. "He is truly gifted." It's easy to understand why Hayes named his book Riding Home. It's what he helps others do. "It took me 50 years, but I'm finally a 'psychiatrist' — a horse psychiatrist," he says half-jokingly. "You know what they say: 'If you get to live long enough, your life will reveal itself.'" 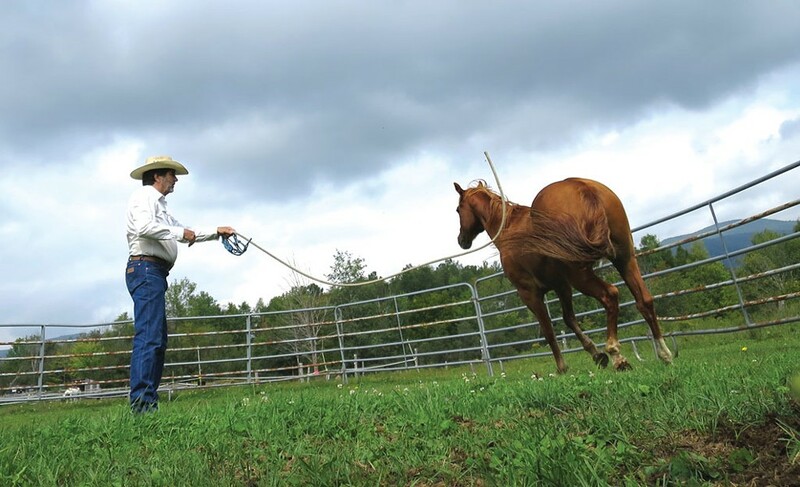 Tim Hayes and Stephanie Lockhart will give a live demonstration of natural horsemanship and the healing power of horses on Tuesday, October 6, 12:15-1:15 p.m., at the Fields & Courtyards Chapel Lawn, Saint Michael's College, in Colchester. Free and open to the public. Find out more about Tim Hayes, his book and natural horsemanship at hayesisforhorses.com and centerforamericasfirsthorse.org.